Yes, I want my FREE Report now! 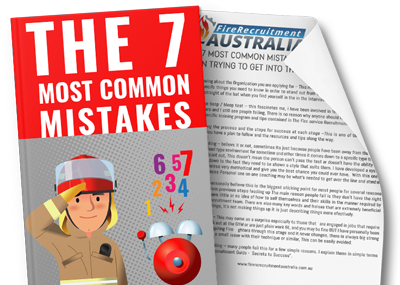 Be aware of the 7 most common blunders that will dash the dreams of thousands of Firefighter applicants this year. Fire Service tests weed out weak and unprepared applicants. Find out which five tests will defeat most people this year. Sure ... but what type of fit will survive the Fire Service physical tests? People fail their interview for 3 primary reasons ... and they're all avoidable. Without ANY prior knowledge of Australian Fire Service Recruitment, or any previous training on how to become a firefighter, with the right tools and the right training anyone has a fighting chance! That's why 90% of my students succeeded in landing a job without any previous knowledge or experience of AFS Recruitment processes." Do you want to know how thousands of applicants have blown their chance? Learn from their mistakes so you don't have to tell your family and friends you missed out this year.